Our Greece self-drive holiday itineraries offer the opportunity to discover some of the most beautiful areas of Greece. How is it possible that such a small country has so much to offer? Mainland Greece is a treasure chest of unique experiences whether in the great outdoors or in the realm of culture. Here you will find some of the most popular landscapes in Greece – landscapes with alpine valleys, mountain peaks above the clouds, gorges and canyons, paths through oak, beech and plane tree forests, rivers spanned by arched stone bridges, watermills, waterfalls, national parks with rare flora and fauna. Visit the Peloponnese, Olympia, Delphi, Meteora, Northern Greece, and much more. Our self-drive tours allow you to explore areas rarely featured in holiday brochures, and will well reward the more independent traveller in search of more adventure than the normal holiday provides. We have designed these holidays to be as flexible as possible. Our below itineraries are fully flexible and can be tailored to fit your particular interests. This Greece self drive holiday package combines Athens and tour of the Peloponnese with the freedom of a car. 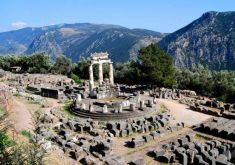 This Greece self drive holiday package combines Athens and the cities of Nafplion, Olympia, Delphi and Meteora. Drive through Delphi, Meteora and Volos to the co-capital of Greece, Thessaloniki. This Greece self drive holiday package combines Athens and the main mainland sightseeings.